Welcome to the web pages for Diana Xarissa Dunn, an indie author who writes under three pen names. 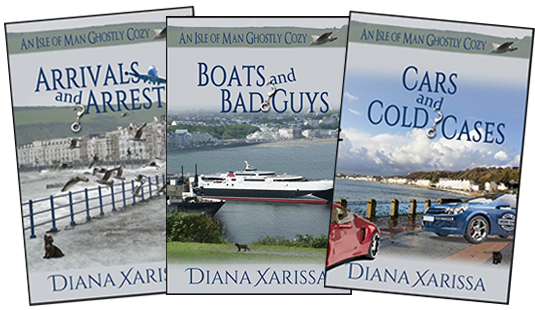 As Diana Xarissa, Diana writes the best-selling Aunt Bessie Mysteries, and her new series, the Isle of Man Ghostly Cozy mysteries. 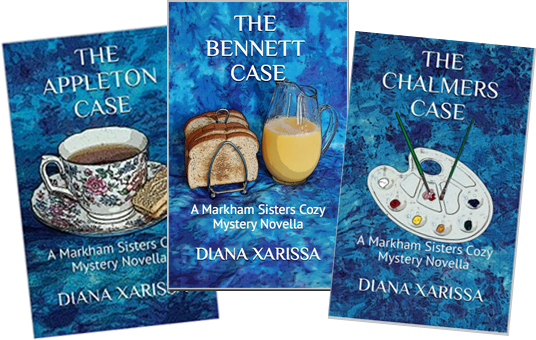 Diana also writes the Markham Sisters Cozy Mystery novellas and the Isle of Man Romances. 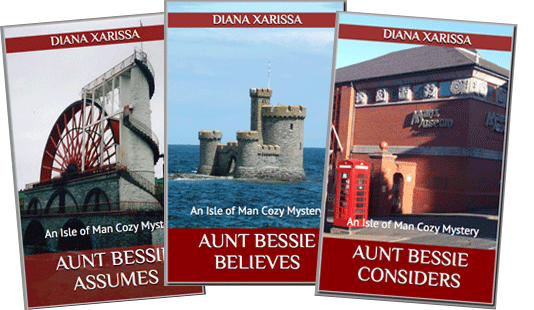 The Isle of Man Cozy Mystery series features Aunt Bessie, a character who first appeared in the Isle of Man Romance Island Inheritance. In that novel, she had just passed away, so the cozy mysteries are set about fifteen years before the romance novels (circa 1998). Bessie's lived her entire adult life in a small cottage on Laxey Beach in the Isle of Man. Until now, murder was just something that happened in her favourite fiction. The Isle of Man Ghostly Cozy series tells the adventures of Fenella Woods, who is surprised and thrilled to learn that she's inherited a beautiful seaside apartment on the Isle of Man. Although she was born on the island, her family moved to the US when she was only two, and she's never even visited there before she sells everything she owns and takes up residence. Finding dead bodies wasn't in her plans, but then living with a ghost and a kitten weren't either. The Markham Sisters Cozy Mystery novellas tell the adventures of Joan and Janet Markham as they open a bed and breakfast in Derbyshire. The two retired schoolteachers find their new life is full of interesting characters, unexpected events and unexplained happenings. The stories are novella length (around 25,000 words) and are lighter story lines. The Isle of Man Romance series consists of "sweet" romance novels set in the beautiful Isle of Man. The novels feature re-occurring characters and might be best read in order, but each one is a complete story on its own. As D.X. Dunn, Diana writes both young adult (ages 12 and up) and middle grade (ages 6 to 12) fiction. 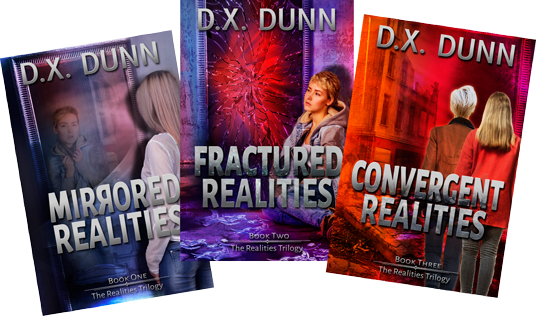 The Realities Trilogy follows the adventures of Catelyn Abbott as she stumbles into an alternate reality where everything is scarily similar to home. With her father trapped in the alternate reality, Catelyn isn't sure who she can trust as she struggles to find a way to rescue her father and then get them both back to their own reality. Diana's middle grade books, the Distania Chronicles, follow two ten-year-old best friends who accidentally discover another world full of magic, dragons, unicorns, and wizards. 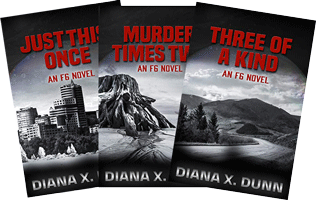 As Diana X. Dunn, Diana writes the F6 series of novels, mystery/thrillers set in the not-too-distant future. F6 was adopted by an international multi-governmental agency that doesn't officially exist. Throughout her childhood she was simply identified as F6, the sixth female baby adopted into the program. Now she changes identities as often as other women change their shoes, moving through the world completing top-secret missions and keeping her distance. She's just trying to do her job. Somewhere out there is one man who wants to stop her. Diana grew up in Pennsylvania and earned a BA in history from Allegheny College. She later moved to Washington, DC for work. There she met and was swept off her feet by an Englishman who married her and whisked her away to the north of England. A new job meant a move to the Isle of Man for the newlyweds and they lived there happily for over ten years. During that time, Diana added an MA in Manx Studies to her qualifications and they added two children to the family. In 2008, they decided to return to the U.S. to give their children a chance to experience the American way of life for a while. Now happily settled in Western New York, Diana writes, looks after the children, volunteers at the local schools and writes more. She loves to hear from her fans and invites you to visit her on Facebook, Twitter or Goodreads or to send a comment using the Feedback page.